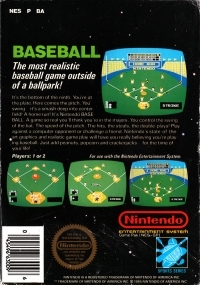 Box Text: The most realistic baseball game outside of a ballpark! It's the bottom of the ninth. You're at the plate. Here comes the pitch. You swing - it's a smash deep into center field. A home run! It's Nintendo BASEBALL. A game so real you'll think you're in the majors. You control the swing of the bat. The speed of the pitch. The hits, the steals, the double plays! Play against a computer opponent or challenge a friend. 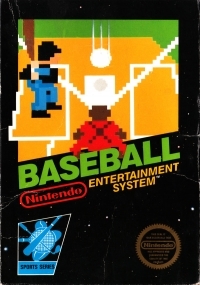 Nintendo's state-of-the-art graphics and realistic game play will have you really believing you're playing baseball. Just add peanuts, popcorn and crackerjacks... for the time of your life! 08-08-2014 critter7405 Box Text The most realistic baseball game outside of a ballpark! It's the bottom of the ninth. You're at the plate. Here comes the pitch. You swing - it's a smash deep into center field. A home run! It's Nintendo BASEBALL. A game so real you'll think you're in the majors. You control the swing of the bat. The speed of the pitch. The hits, the steals, the double plays! Play against a computer opponent or challenge a friend. 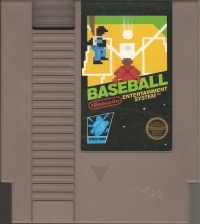 Nintendo's state-of-the-art graphics and realistic game play will have you really believing you're playing baseball. Just add peanuts, popcorn and crackerjacks... for the time of your life! This is a list of VGCollect users who have Baseball (5 screw cartridge) in their Collection. This is a list of VGCollect users who have Baseball (5 screw cartridge) in their Sell List. This is a list of VGCollect users who have Baseball (5 screw cartridge) in their Wish List.